Tyneside A Cappella have been invited to perform on the 1st of April 2017 at the 10th anniversary concert at West Moor Community Centre,Benton Lane,Newcastle upon Tyne, NE12 7NP. This is the chorus' normal rehearsal venue and they will be appearing along with other acts on this celebration evening. A packed house to celebrate the 10th anniversary. Superb singing by Tyneside A Cappella. 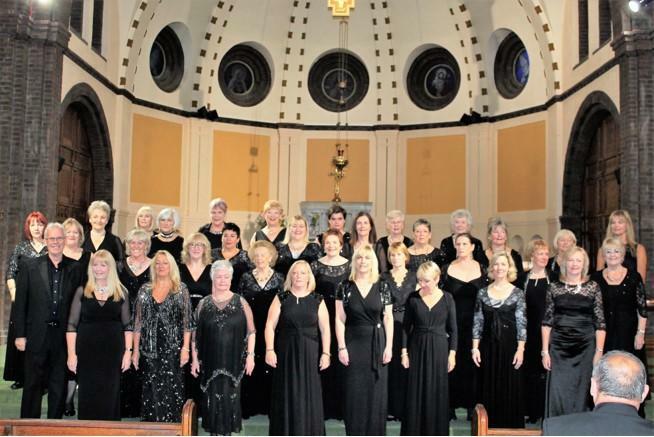 The chorus will once again be the guests of Compass Acapella at an evening concert on Tuesday the 16th of May 2017 at All Saints Church, Cleadon Lane, Cleadon, Tyne and Wear, SR6 7UU. The concert will commence at 7.30pm. A fabulous set delivered by the chorus to support Compass Acapella, and helping the church to raise funds. 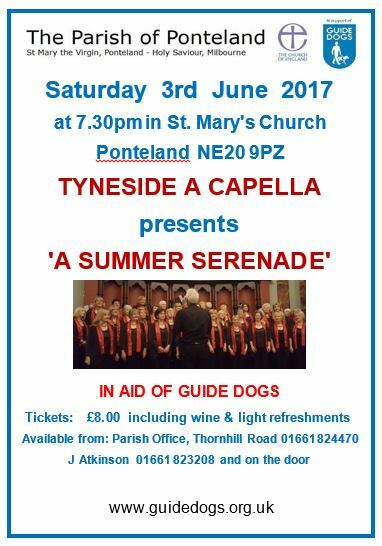 Tyneside A Cappella will be singing in a charity concert on Saturday the 3rd of June to help raise funds for the charity 'Blind Dogs'. The concert is being held at St Mary's Church,North Road Ponteland, Northumberland NE20 9NU and will commence at 7.30pm. Special guests for the evening will be announced soon. A wonderful concert for an early Summer evening captivated the audience in this beautiful almost full church. Over £600 was raised for the charity and some of the guide dogs were there as well. Fabulous support from Enigma nd Out of the Blue to send the audience away with lots of happy melodies and memories. 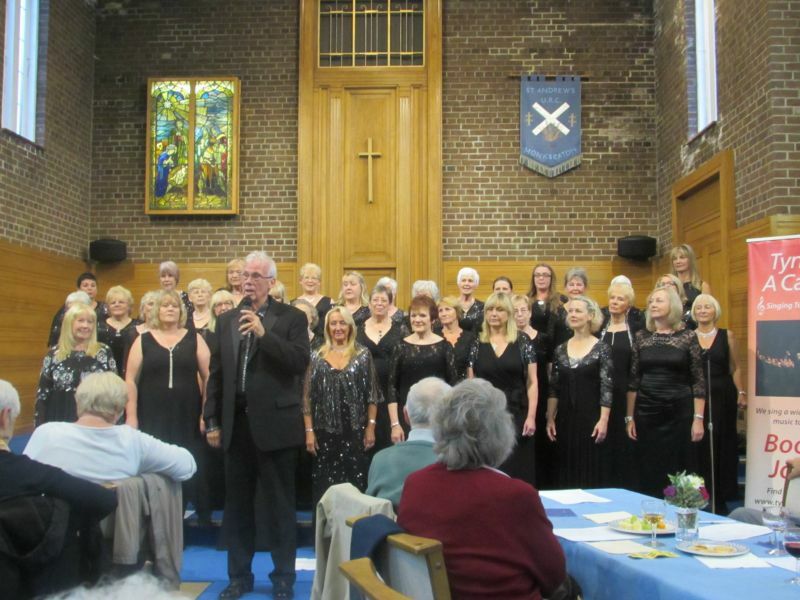 The chorus has been invited to sing for The Whitley Bay Ecumenical Churches cheese and wine evening, being held at St. Andrew's URC Church, Eastfield Avenue, Monkseaton, Whitley Bay NE25 8LU, on the evening of the 29th of June. The evening is a fundraiser for local charities. A stunning performance by the chorus (raising £527 for charity) which had the full house on it's feet demanding more - as if we could refuse! Tyneside A Cappella will join forces with Compass Acapella at Beamish Museum on Saturday the 15th of July 2017. The lunchtime concert will commence at 1.30pm in the Masonic Hall in the town centre. Another fantastic performance to a 'packed house' with our brother chorus Compass Acapella. 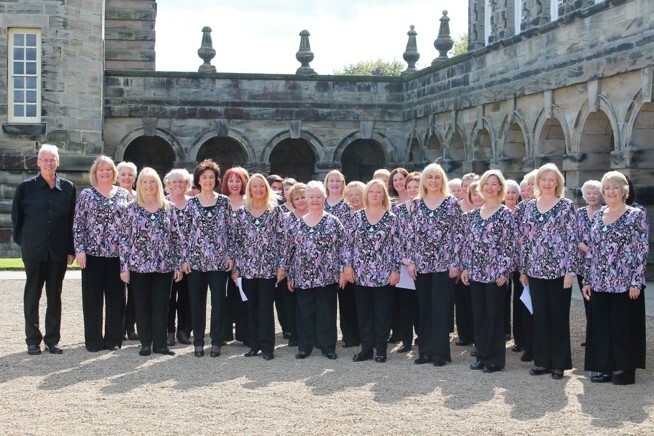 The chorus will be performing at Seaton Delaval Hall, The Avenue, Seaton Sluice, Whitley Bay, NE26 4QR on Saturday the 2nd of September. The performance will include special guests and the performance will start at 12.30pm. A fabulous perfromance at Seaton Delaval Hall which enchanted the audience from start to finish. 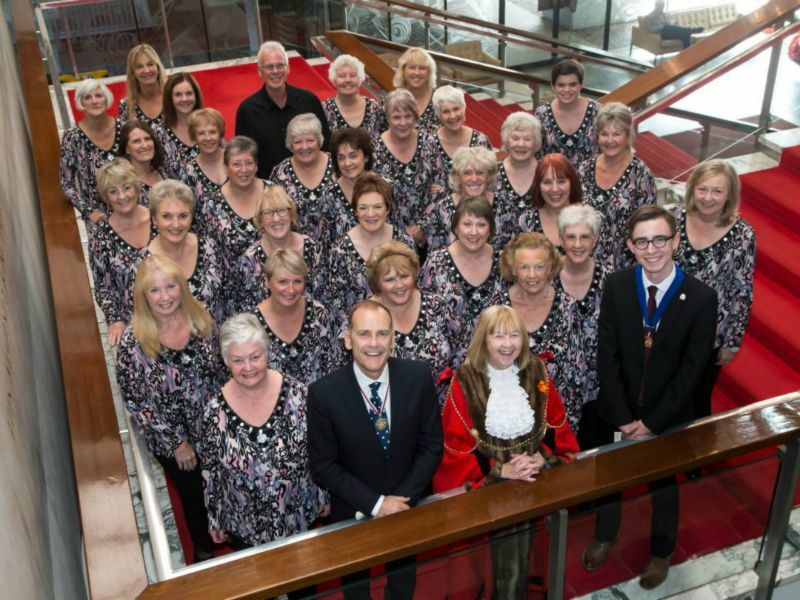 The chorus has been invited once again to perform at a Citizenship Ceremony at Newcastle Civic Centre at 2pm on Wednesday the 6th of September 2017. This is a private event. A wonderful performance by the chorus to welcome 23 world wide families as British citizens. 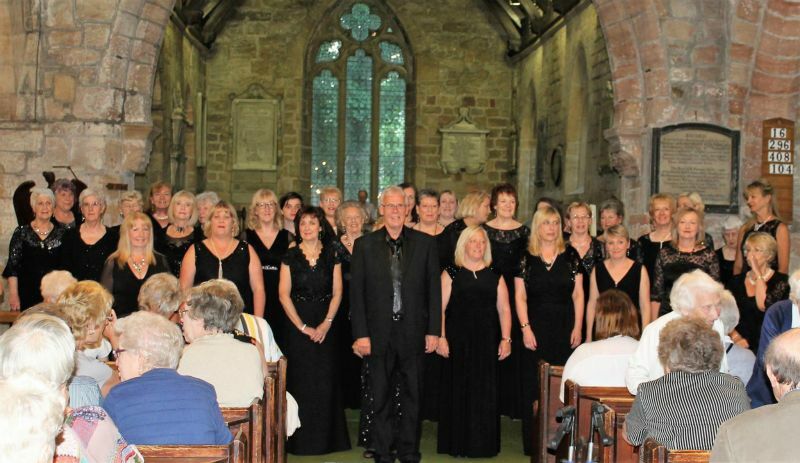 Tyneside A Cappella have been invited to perform in concert at St Edwards R.C. Church, Coquet Avenue, Whitley Bay, NE26 1EE, on the 16th of September 2017. The chorus will be joned by guests Compass Acapella and the concert will start at 7.30pm. The concert is in aid of 'Walking With'- a project which supports Syrian refugee families in North Tyneside. A fabulous ‘double header’ concert with Compass Acapella tonight. 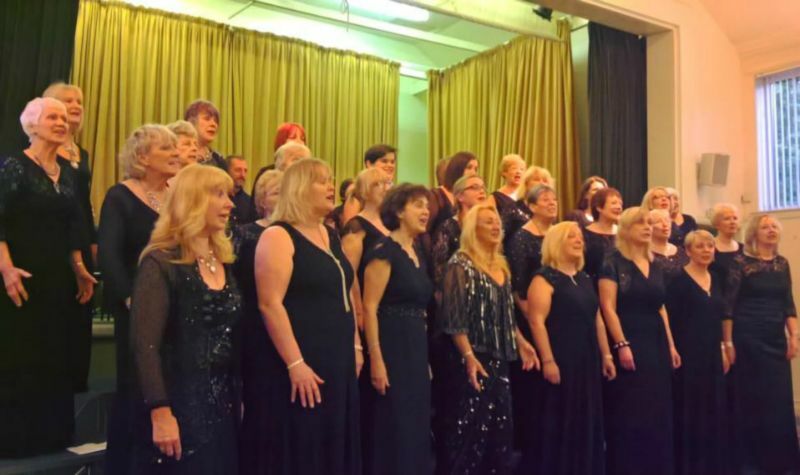 Twenty eight fabulous songs delivered with professionalism and precision to a capacity audience – lots of happy faces leaving at the end and a lot of money raised for the ‘Walking With’ charity supporting Syrian refugee families in North Tyneside. 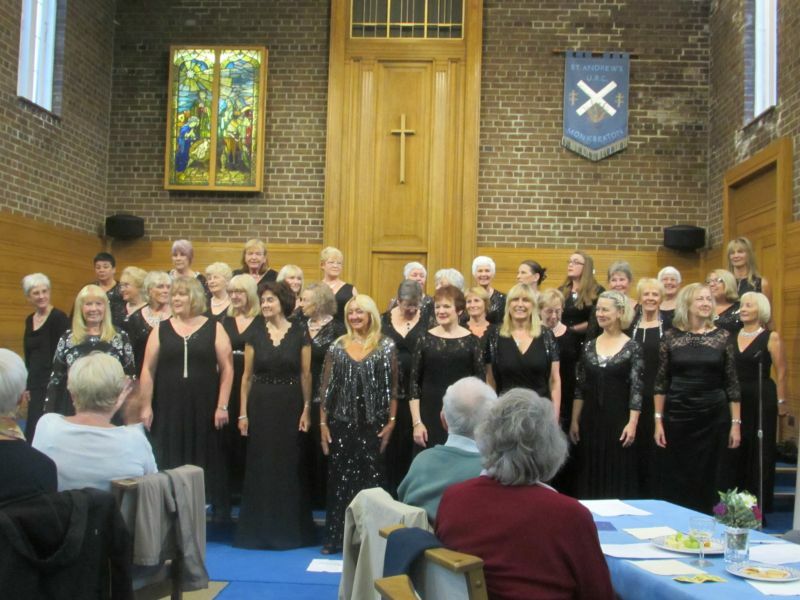 The concert raised a staggering £1,314 on the night! 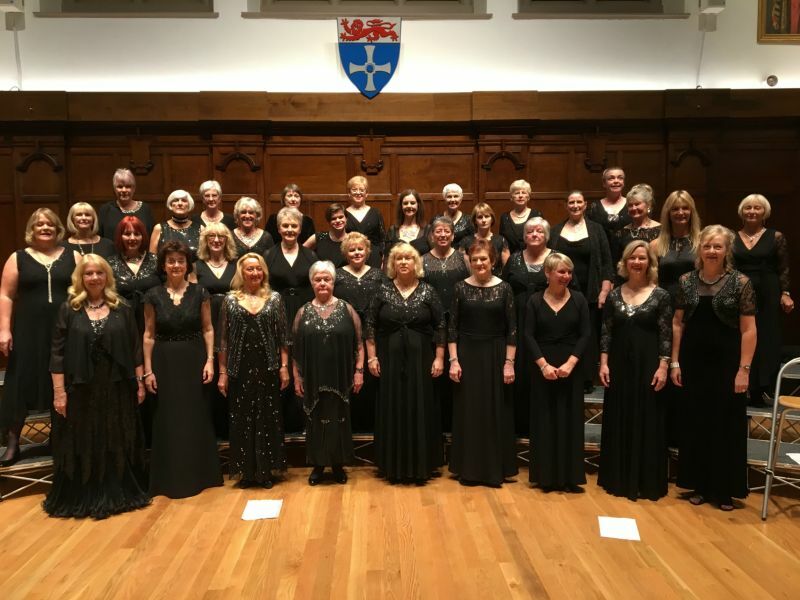 Tyneside A Cappella have been invited to sing as guests of Compass Acapella in a concert to raise funds for the Grafters Club, a charity based in the RVI in Newcastle, for children who have experienced burns injuries. The concert will take place in the prestigious Kings Hall which is part of Newcastle University and will commence at 7.30pm. The Kings Hall is in the Armstrong Building which is opposite the RVI on Queen Victoria Road, Newcastle upon Tyne, NE1 7RU. A superb performance supporting Compass Acapella raising over £1600 for this small but very worthwhile charity. 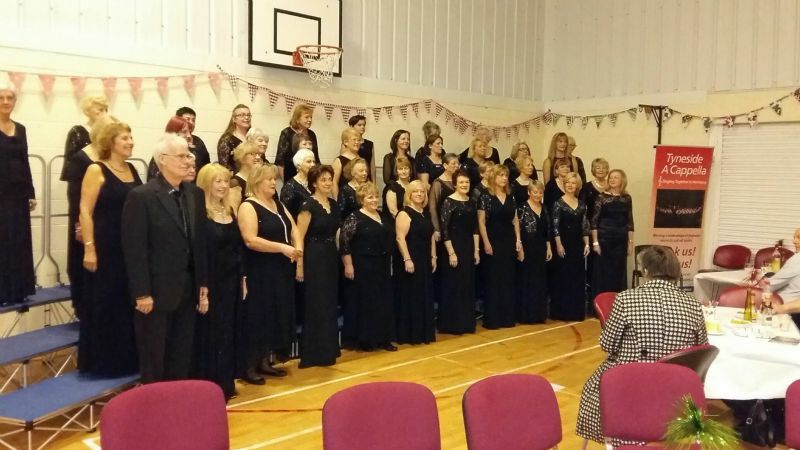 The chorus has been invited by Compass Acapella to guest on a show being held in Jubilee Hall, North Street, West Rainton, Co Durham, DH4 6NU. The start time will be 7.30 pm. A thrilling performance given by both choirs to a packed house and a standing ovation and £950 raised for the church charity. The chorus has once again been invited back to sing at the official lighting of the Christmas tree sent from Norway. Every year the people of Bergen in Norway send a tree to the city of Newcastle and the chorus will be singing festive music at the 'switch on'. The event takes place at Newcastle Civic Centre at 6pm. 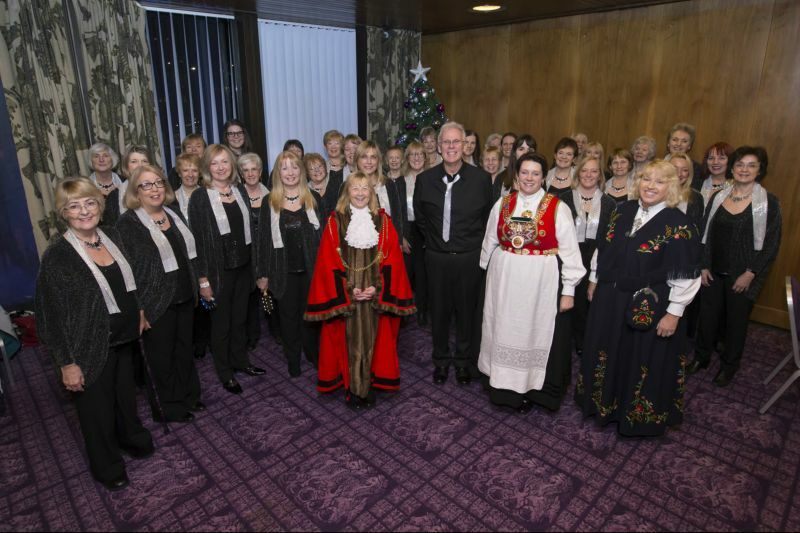 Despite the weather (snow) the chorus provided Christmas musical cheer at this wonderful event and later entertained the civic party from both Newcastle and Bergen. After a hugely successful 2016 Christmas concert in The Masonic Hall at Beamish Museum, the chorus has been invited back to perform on the 9th of December 2017. 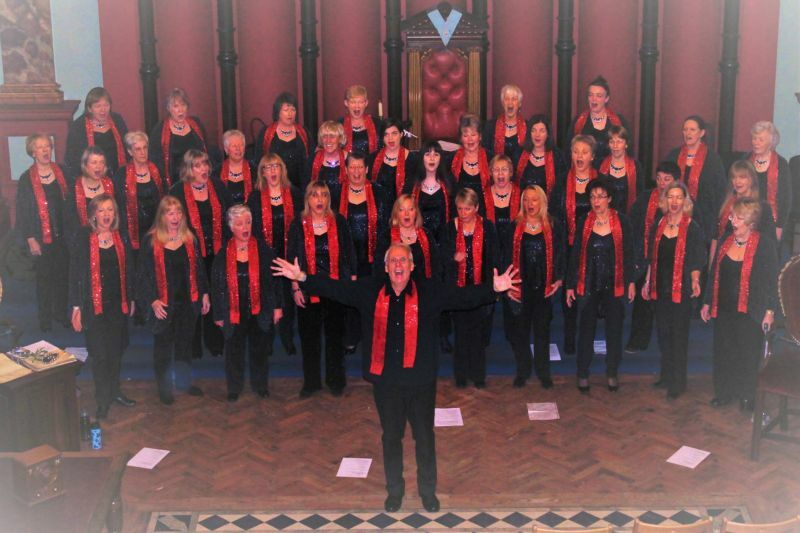 The chorus will present their Christmas repertoire alongside songs from their popular show repertoire. The concert will start at 1.30pm. The packed audience in the Masonic Hall enjoyed a thrilling performance of Christmas music and repertoire songs. One gentleman in the audience said the hairs were standing up on the back of his neck when the choir sang Bohemian Rhapsody. Doesn't get much better that that. 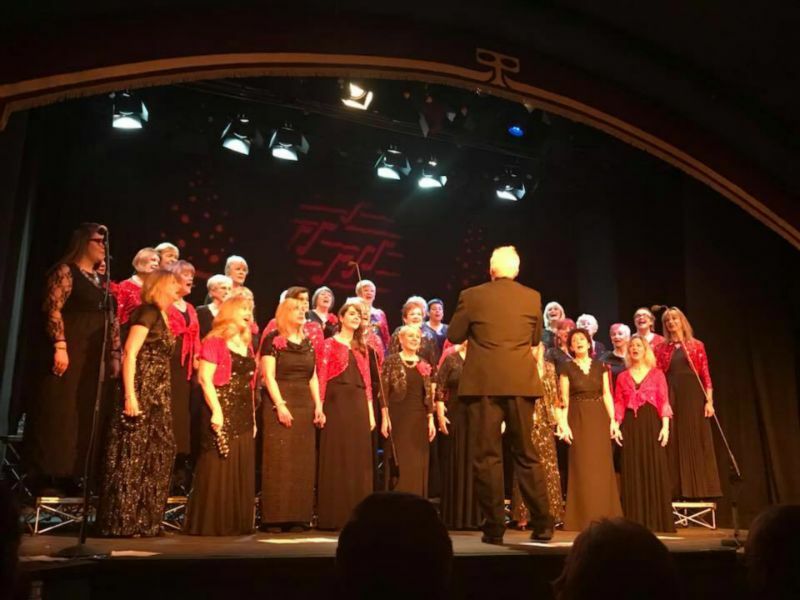 Tyneside A Cappella have been invited by Backworth Male Voice Choir to share a Christmas concert with them on Saturday the 16th of December 2017. The concert will take place at The Church of Saint Hilda (Marden with Preston Grange), Stanton Road, Preston Gate, North Shields, North Tyneside, NE29 9QB. The concert will start at 7pm. 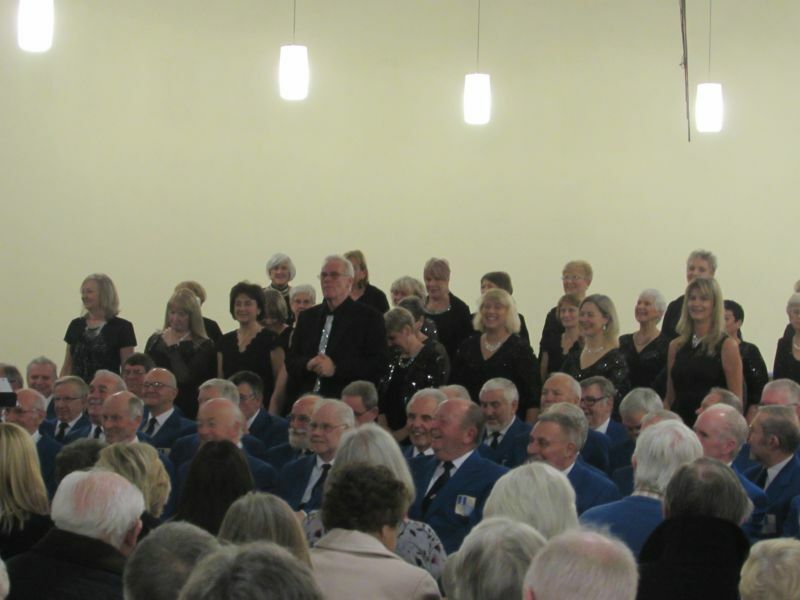 A full house greeted the chorus as they appeared as guests of Backworth MVC for this wonderful Christmas concert. It was freezing cold on the outside, but on the inside both choirs presented a wonderful selection of festive music which sent the audience home happy. Sincere thanks to you and all the 'girls' for the wonderful performance last night. You may have been low on numbers but certainly not on quality. Quite simply, it was uplifting and contributed greatly to a very successful concert. We must meet up again next year. 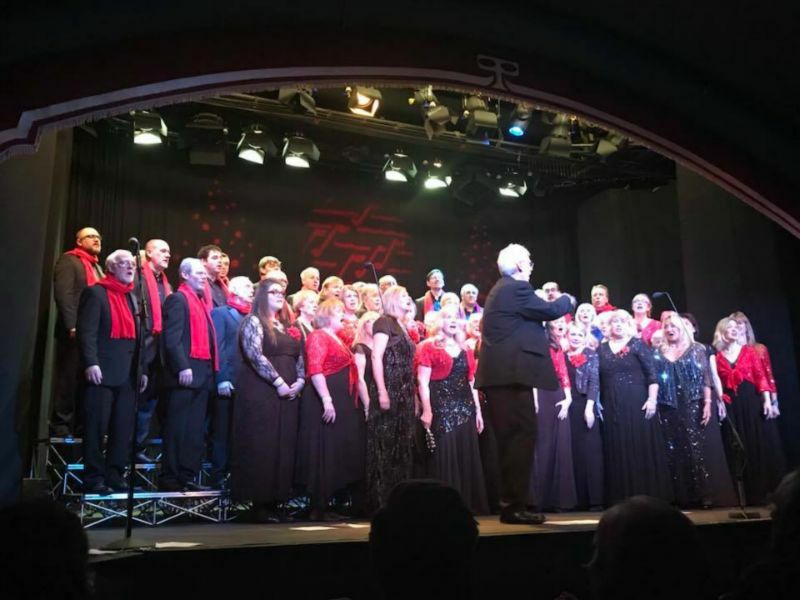 For the third year in a row Tyneside A Cappella will be staging a Christmas concert to raise funds for FACT (Fighting All Cancers Together), The show on Monday the 18th of December at The Little Theatre, 3 Saltwell View, Gateshead NE8 4JS . 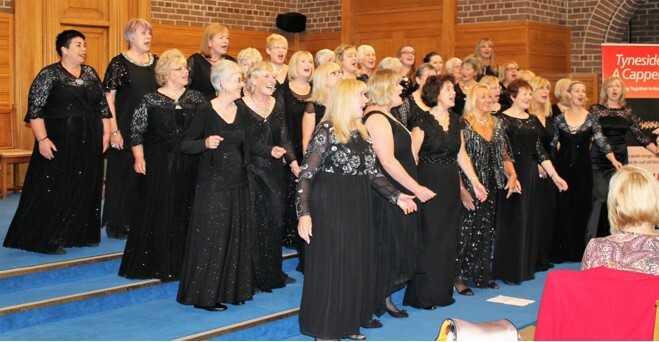 The concert will commence at 7.30pm and special guests for the evening will once again be Compass Acapella. At the end of our performing year the chorus gave a breathtaking performance supported by Compass Acapella. The audience were thrilled by the mix of music and were singing the songs as they left the theatre. FACT were delighted with the evening which raised lots of money for this deserving charity.